Another little mountain painting. I do enjoy feeling transported to a vacation spot by simply picking up a paintbrush. It’s a very cool way to fly. Yesterday’s painting was nice, and I enjoyed making it, but I thought this time out, I would make a few changes to try and improve it. I’m working on skies, so I decided to make the sky a larger part of the painting, and rather than use the tube purple (Cotman Dioxazine) that I used in that painting, I thought I might get more color unity by mixing a purple with the color I used in my sky (which was all cerulean). It went a bit pear-shaped, because in order to get the hue I wanted, it turned out that I needed more ultramarine and hardly any cerulean. I did mix each of the purples in today’s painting, adding more pigment and less water as I came forward….but they look almost exactly like the tube paint version I used yesterday…..probably should have used cerulean to get that color unity, hehe. I think the purple would have been much cooler, and bluer, but it probably would have gone better with the sky. I’m finding the July “paint a watercolor every day” project to be interesting, and definitely a learning experience! It helps to reinforce what I’m learning when I go back and try again tomorrow. Which is what I will do….tomorrow. I actually prefer yesterday’s to this one, but I may give this concept another try tomorrow, this time with a more dramatic sky, and see what takes place. Or I may try something completely different, such as a bird, since Draw A Bird Day fast approaches on Wednesday! Until then, enjoy your week, and thanks as always for your visits and comments/suggestions for improvement. They are all greatly appreciated! Peace. I haven’t seen yesterday’s yet, but this really does give a feeling of distance, the mountains fading away into the sky. I like it! Thanks, Nicola. Skies are getting a bit easier. Nice job Laura! Love the detail in the front mountain and the sky in this one!! Thanks, Jodi! My landscapes need more zippitydoo. Hehe. I’d add a tree if I knew how to paint one. Have a great week! I think it’s great and you are making great strides!! Thank you. I’ve ordered a DVD for landscape work from Charles Reid. I really love his loose style and he’s a phenomenal teacher, so I’m hoping that’ll help me add some pizzazz. Thanks, Jodi! Wow, a beautiful sky at that link. Thanks for letting me know! I like how the mountain has a feeling of greenery in it. The sky is wonderful! Thanks, C! Hoping for a more dramatic sky at some point. Slow, but sure, (I hope). Beth, thank you so much for your comment. I really needed that word of encouragement today. I really appreciate it!! Very kind of you!! Have a great week! You too dear Laura! It’s holidays so I can have time to comment finally. No more deadlines. It’s amazing what the hand, brush and watercolor can do. I would say serenity describes this beautiful scene today! Happy day Laura. Thank you, Sharon! I appreciate it. Enjoy your day! Thank you, Inari! I appreciate it. Working on my skies, especially. 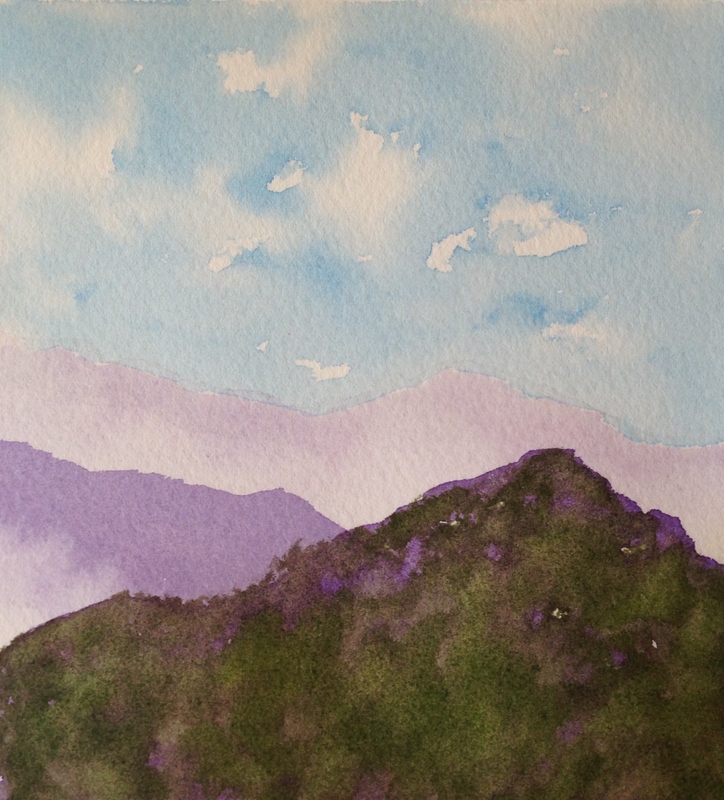 Those purples and greens….looks like a cloud inbetween the back ground and the forefront mountain….dreamy painting! Thanks, Rebecca! I’m glad you like it. I think I may make the sky even larger in the next one, maybe do something more dramatic. Are you back home now? Thank you, Ann! I’m glad you like this one. Bigger sky tomorrow (maybe). Hehe. Happy Monday and a good week to you! I like your colour explorations :-). Thank you! I expect there will be more…. 😀 Glad you’re enjoying them. Wow, do you really think? I was thinking about possssssibly opening an Etsy shop. Not sure if that’s the right avenue, as it seems there is so much going on over there, how do you differentiate yourself? But I really appreciate your comment. I do feel that I am getting a better handle on WC and I do think painting every day is helping. Thanks so much, BB! Thanks for the encouragement! So I guess you have an account with them? You must be happy with it, to recommend them? I appreciate your help with this. I’ve been so on the fence! Wondering if it’s a bit too soon (among other things). I haven’t sold a lot of things from Etsy, but I like the fact that I can do it all from home. And it is nice to know that if I didn’t sell the art, it only cost me $0.20. I don’t have a whole lot on there as my other jobs get more focus. For now, Etsy shop is just for on the side. It would have to be for me, as well….hmm…definitely something to think about. I’ve been pondering this for some time. I appreciate your help with it, BB. Any time you have a question, let me know. I would love to share the little I know. I am sure you also do a post and ask the other followers for their help as well. Thanks very much; I really appreciate it! Your landscapes are lovely Laura! It shows. Paint on happy one! Thanks, Rita! Quite a learning experience!! Real nice color choices and detailing in the foreground. Thanks, Mary. Rolling out a big sky and little mountains for tomorrow. *fingers crossed*. Definitely improving at skies, I think! Did you struggle with skies early on? Your mountains are beautiful! I especially like the details on this one! Thanks, Eileen! I hope to do more of these. I’m glad you like this one. Trying to really focus on watercolor at this point. Thanks, Margaret, that’s what I was going for in this one!